You know those nights where you make a nice steak or chicken and you do not have anything to serve on the side? That was me Sunday night. I looked in my pantry and I didn’t see much. I looked in the fridge and it was practically empty except for a few veggies. I sat at the kitchen table debating, what do I make to go with my steak? Then I realized, I could throw those veggies together, add an orange and I have a side salad. Perfect! So I chopped my veggies, threw together a simple dressing and I had a fabulous salad that even my Husband loved. 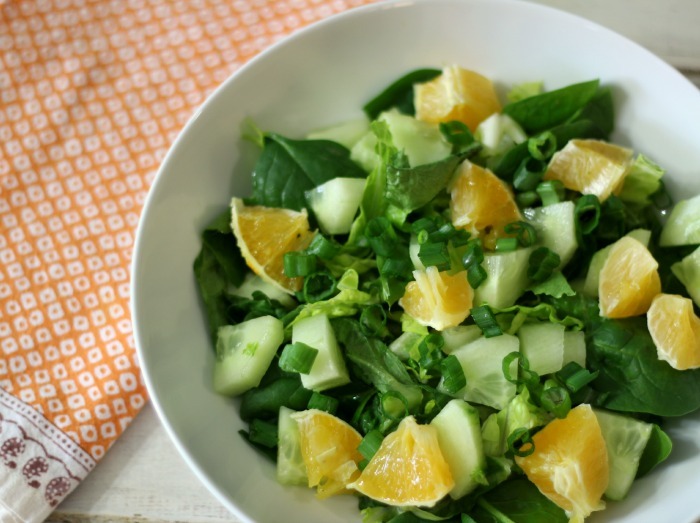 The salad is made with romaine lettuce, spinach, cucumbers, scallions and wonderful navel orange. 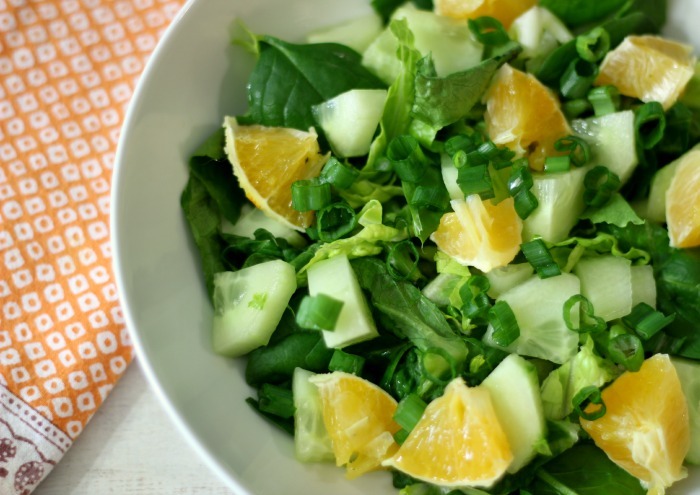 The flavors are so light and refreshing together and oranges are a perfect complement to the dish, plus its perfect because they are in season right now. If you wanted to make this a meal salad, add some cooked chicken and some slivered almonds too it. I bet that would be fantastic. The dressing is a simple champagne vinegar, orange juice and olive oil. It can’t get any easier than that. 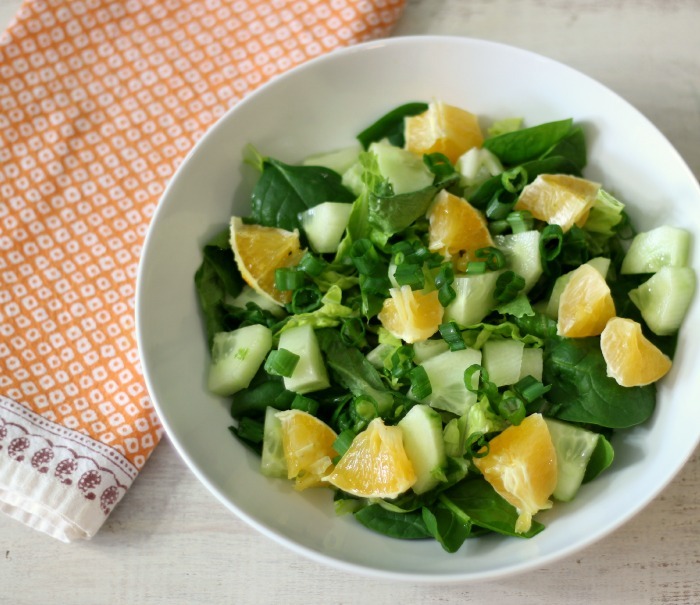 A light, refreshing, sweet and savory side salad made with cucumbers, spinach, scallions and fresh oranges and topped with a simple orange flavored dressing. Evenly divide all of the fruit and vegetables between 4 bowls. To make dressing: In a small bowl, ad orange juice and champagne vinegar. Whisk in olive oil. Pour over salad. Well that’s it for me today. I hope you have a great rest of the week. 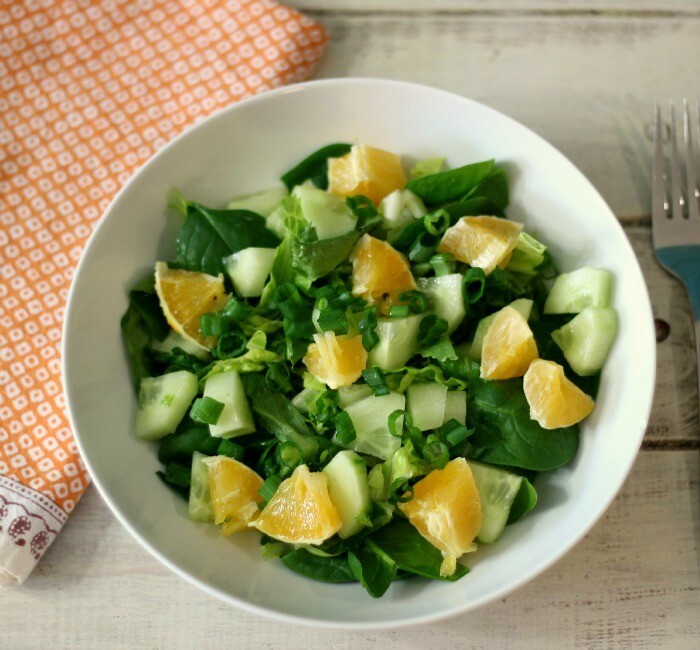 A delicious and fresh citrus salad. Perfect to go with any meal. Thank you so much! I loved it and it’s so simple and loaded with nice flavor.